The Floor Plans solution from the Building Plans area of ConceptDraw Solution Park includes the vector stencils libraries with symbols of interior design elements, furniture and equipment for drawing hotel floor plans and space layouts using the ConceptDraw DIAGRAM diagramming and vector drawing software. A “hotel” is an establishment, which owners provide lodging to other people on a usually only short-term basis. These owners of such establishments usually charge their guests for staying in their accommodation on a short basis, but nowadays some people even live in the hotels for a long period of time, finding such places quite convenient and relaxing as there is no need to take care of that place themselves and so the food is often also available during the day, so no need to cook for themselves. It was very popular to stay a night or two in such old fashioned hotels as well as for a long time some time ago instead of buying your own house or apartment or to rent those houses or apartments. The difference between renting an apartment and renting a room in a hotel is that staying in the hotel you can be sure that your room will be taken care of and so there will be no need in cleaning it yourself. There are other advantages of staying in the hotels instead of renting some flat to stay there on your own as in this case you can always have food which may be included in the price of the staying in the hotel for a certain number of days. Having these two options you might go for a first one and find a good looking clean room in a hotel with a good reputation in a good location, but if you like making food yourself and if you are sure you are a good chef to be able to cope with somebody else’s kitchen and that the available kitchen equipment will be the right one for you in the right quantity, then you might have even bigger choice in the large number of the flats and houses offered to be rent, especially in big cities. Sometime a rented apartment can please people only in case they can find someone to hire to help clean it for money or even to make some food for them. The facilities available in the hotels can very much vary depending on the reputation, the given “scores” to the hotel and so how many “stars” it gained. The “stars” are usually given depending on how comfortable the location of the hotel for the tourists is and if the service is good enough and if there is a swimming pool and other facilities – so many different factors should be taken into consideration to decide which of the hotels worth only one star or all five. Usually, 5-star hotels are very expensive, but, again, it always depends: on a country where this hotel is, on a city or town, on how unique and interesting its interior is, etc. In Turkey and in Egypt the 5-star hotels may be so much cheaper than similar, but in Switzerland, for example. So, it is always better to check for the best prices in advance and so to make your decision about where to stay a long time before you come there and pay for it. It is very useful to read the comments on Internet of those who had experience in staying there before. Some cheap hotels provide very cheap accommodation, but you cannot expect much more than a simply good quality mattress in a not very large room for that price. Paying ten times more money it becomes possible to get the large suites in a 5-star hotel or at least a 4-star one, where there will be a large bed waiting for you with the best quality mattress as well as other luxury and good looking furniture. In such expensive suites you may find at least one dresser, your own kitchen with a fridge and other kitchen facilities, enough chairs for a couple of people even in a single room and a table or even a few tables, your own television with a large flat screen as well as a great looking bathroom, probably with jacuzzi. There are very many different hotels all over the world, especially in the big cities in the popular countries for tourists to come and visit. There is also a huge choice of the small hotels, which can be rented at a low price and which may offer only basic guest facilities, but for a fair price which can suit the students who do not work yet, so they do not have enough money for a more expensive choice. Although it is always a pleasure to stay in a large expensive hotel, where all of the needed facilities are, including the swimming pool, business rooms, childcare zone with playground, conference facilities, sport courts (usually football pitch, tennis court or/and basketball court), gym, restaurants, spa, etc. The largest hotel in the world in 2006 was named by the “Guinness World Records” and it was “First World Hotel” in Malaysia where you can find a choice of 6118 rooms. There is another one in Moscow with 7500 rooms, and another one in Las Vegas with 7117 rooms and the last biggest called “MGM Grand Las Vegas” with 6852 rooms. The highest hotel in the world is in Hong Kong as it is located at a distance of 484 metres above the ground. The oldest one is in Japan, in the city – Yamanashi. Its owners are people whose ancestors used to run the very same place since 718. The most expensive of all hotel is a luxury one called “Waldorf Astoria New York” and it cost for Chinese “Anbang Insurance Group” 1,95 billion US dollars in 2014. The most popular categories include the terms, such as “boutique”, “luxury”, mentioned before, “full-service”, “focused service”, those with limited service called “economy” hotels, “extended stay”, “destination clubs” or “timeshare clubs”, “motels”, “bunker” hotels, which are popular in Switzerland, “cliff” hotels, “cave” hotels, “capsule hotels”, which are very well known and popular in Japan, “one-day room” hotels and other. In case you need to make a plan for your own future hotel or to do it for someone else, then you can always find the way to make such template very quickly and to have a very good looking result in the end. Whichever type of the hotels you want to illustrate in a way of a floor plan, you can always do it with ConceptDraw DIAGRAM drawing application, as it was developed by a team of IT specialists especially for ConceptDraw DIAGRAM users, so they can enjoy the process of drawing their unique and professionally looking floor plans as well as other schematics, such as charts, flowcharts, diagrams and other. You can always also use ConceptDraw STORE application to make things even simpler as having the needed solutions which can be downloaded from there, such as “Floor Plans” solution for creating Building Plans can be very useful. This solution can be also found and downloaded from this site from the “Building Plans” area of ConceptDraw Solution Park. Solution Floor Plans from ConceptDraw Solution Park provides vector stencils libraries with design elements of interior, furniture and equipment for drawing hotel plans and space layouts. Working as a designer, you might find developing projects exciting and difficult at the same time. It is a challenging task to create a usable interior design that will fulfill all the customer’s requirements. So, in order to aid yourself, you can use special software to create site plans, landscape designs, furniture layouts. 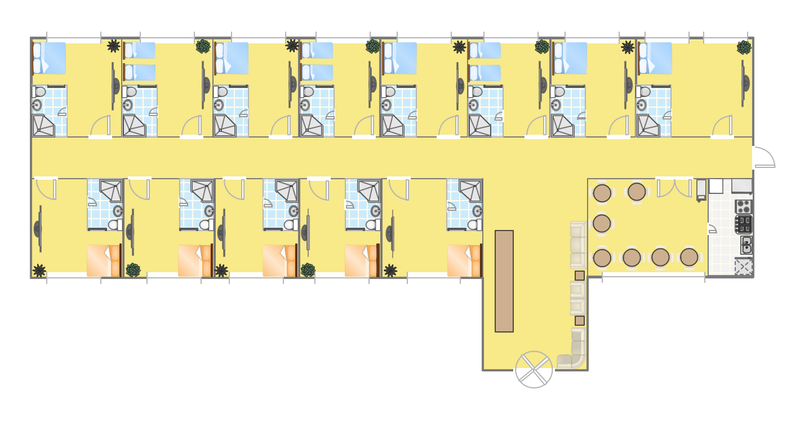 This example of an interior plan introduces an internal area of a small cafe. The floor plan demonstrates interior angle "view from above". It involves many different elements of furniture such as tables , chairs and various cushioned furniture. Also it includes a kitchen fixtures and furniture. Making this plan was managed by the ConceptDraw Cafe and Restaurant Floor Plan solution. The libraries, composing this solution contain about vector graphic 300 objects. It can be use to help interior designers to develop interior design proposals, communicate ideas and concepts that relate to a interior design.